A retrospective analysis of the incidental gallbladder cancer and a review of the laparoscopic cholecystectomy. BACKGROUND/PURPOSE: With the increasingly widespread acceptance of laparoscopic cholecystectomy (LC), the number of cases of incidental gallbladder cancer (IC) has increased. However, the surgical procedure for advanced cancer is still difficult to improve a prognosis. Otherwise, preoperative detecting early gallbladder cancer may be difficult in symptomatic patients with such as cholelithiasis. The present study aims to evaluate the treatment of patients with IC. METHODS: We performed a retrospective analysis of patients with unsuspected gallbladder cancer who underwent LC or open surgery (OS) from 1981 to 2007 at Kitasato university east hospital in Japan. Of 2703 patients who underwent cholecystectomy, 25 (0.92%) with unsuspected gallbladder carcinoma were reviewed. Long-term survival was calculated using the Kaplan-Meier method, and differences in group of survivors were compared by the log-rank test. Multivariate analysis was done using the Cox regression model to determine independent predictors of survival. RESULT: 16 patients (64%) presented with symptom by gallbladder lesion as cholelithiasis or cholecystitis. 6 patients(24%) underwent LC. Histopathological findings of gallbladder cancer were perfomed during operation in 9 patients (36%), and remaining 16 were incidental findings on final histopathology. Nine patients (36%) had mucosal tumors (pT1), 12 had subserosal tumors (pT2), and 3 had serosal lesion (pT3). Eight patients with pT1 tumors who underwent no additional surgery, are alive without recurrence. In patients with pT2 cancer, the mean survival time (MST) was 73.5 months, and the 5-year survival rate was 56%. On the contrary, those with pT3 lesions had poor prognoses (MST; 16 months). The periods from initial operation to the re-operation was 18.4 days (average) which ranged from 8 to 28 days. The peritoneal dissemination was confirmed at re-operation, 2 weeks after initial LC, in one case of pT3, which might be caused by bile spillage during first LC. Fortunately, we did not experience the port-site recurrence. 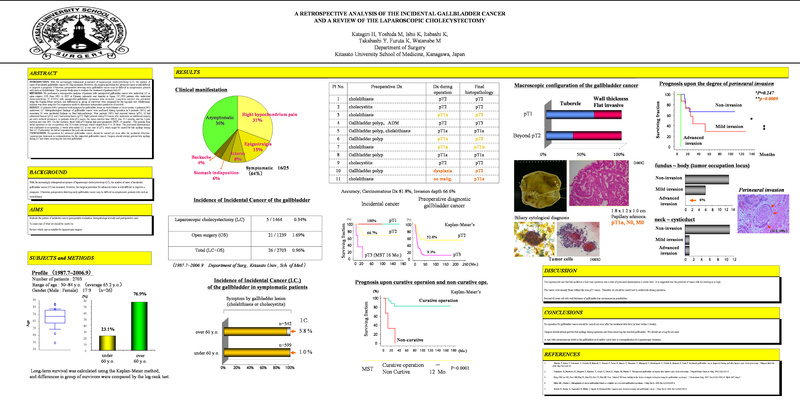 CONCLUSION: Re-operation for advanced gallbladder cancer should be carried out soon after the incidental detection. Laparoscopic treatment is contraindication for the suspected gallbladder cancer. Surgeon should always prevent bile spillage during LC and when removing the resected gallbladder.